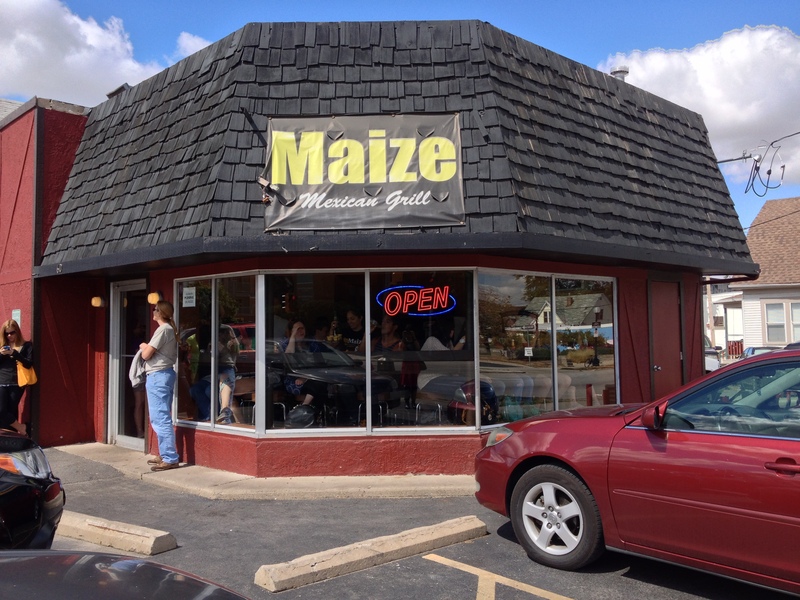 I think we can all agree that Maize doesn’t look like much, but if you can peer in the windows, the place was hopping. The tiny interior has just two bars for seating and the staff were working full out when I arrived at a little after noon. Despite a queue that would have frazzled many a server, the staff were genuinely friendly and found me a spot within minutes. The menu has lots of Americanised Mexican favourites, and indeed most orders I heard were for burritos and “American style tacos” with cheese. 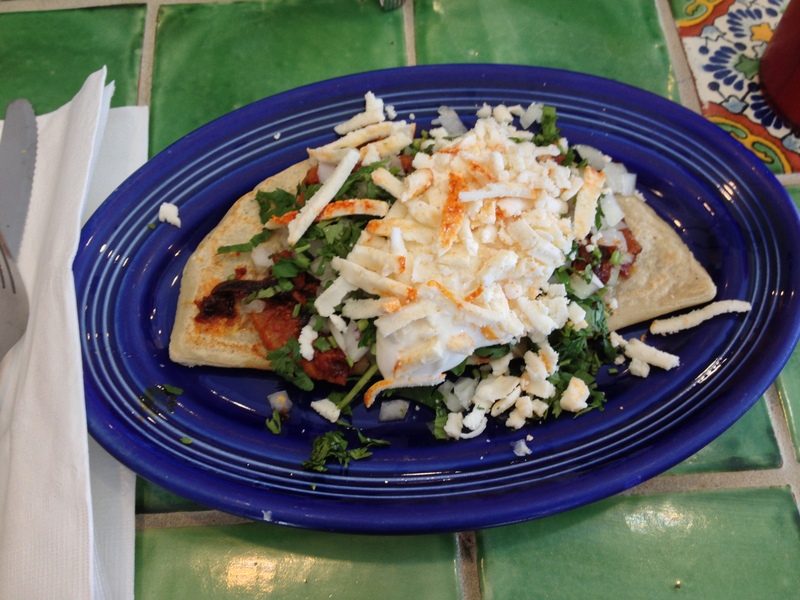 But Maize also features a whole range of Mexico city antojitos, including tlacoyos, huaraches, and sopes. I went for the tlacoyo al pastor, a fat oval masa cake topped with seasoned pork, beans, thick crema, cilantro and what I think was a mixture of cotija and queso de Oaxaca cheeses. The masa was fresh and savoury – like pizza or pie, a really good masa cake is as much about the base as the topping. But I have to say, the garlicky, roasty pork was freaking delicious, and balanced perfectly with what seems visually to be an excess of cheese and crema. Also, did I mention it was $3.50? Bliss, utter bliss. I was leaving the next day, but by fortuitous chance, someone mentioned to me that there were zero lunch options in the local airport. Hmm. Time to fit in one more visit before the flight? You betcha. 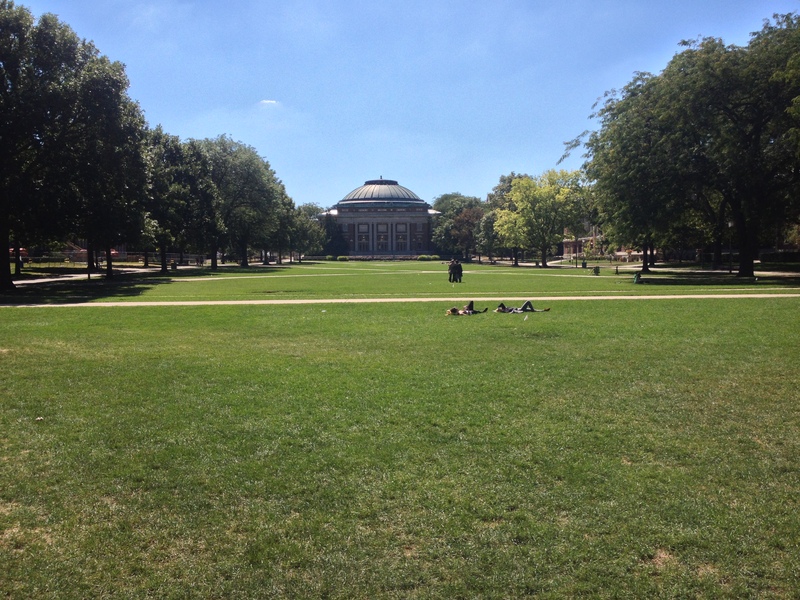 Enjoying my last bask in the beautiful fall sunshine, I spent this morning walking back over to Maize to explore a little more of the menu. In the name of research, right? This time I had to have a taco (not “American style” thank you very much). 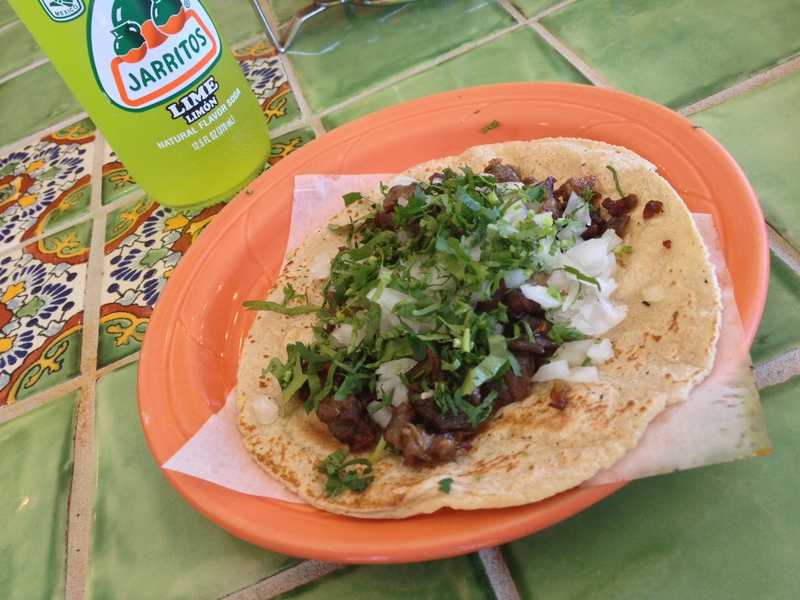 I went for carne asada, which came properly smothered in cilantro and chopped onion. 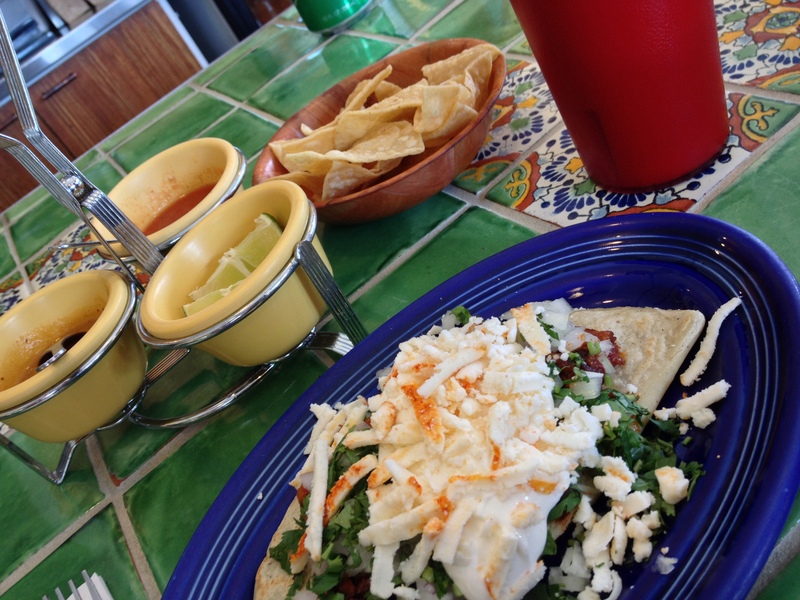 It was correct – maybe not as magical as the tlacoyo, but every bit as good as I’ve had in Los Angeles. Also visible in these pictures, the excellent salsas that come with everything: one a bit spicy and creamy, which I enjoyed, but suspected to be commercial, and the other a boring looking but actually wonderful tomato and tomatillo salsa; thin but vibrant in flavour, like a tomato water, and with a fresh serrano edge. Of course, I also had horchata and Jarritos because, shut up, I cannot reisist Mexican soft drinks. I also had a zucchini flower quesadilla, which they serve grilled rather than fried. The cheese still makes it a bit heavy, but I adore zucchini flower and this one was generously stuffed. It was a flying visit – next time I will be coming to NYC to see you, I promise! I want to do a friend-visiting grand tour of the East Coast next year. Hi Cuz. Not usually that keen on Mexican grub but your descriptions and (I suspect?) Adrian’s photos, have made me reconsider my position. Rachael has found a job at a fab little café/restaurant in North Gower Street, Cessnock, called Cherry and Heather, not the names of the owners as I first thought but the plants associated with their countries of origin – Japan and Scotland. Their Indonesian chicken with peanut sauce roll really is one of the best sarnies I’ve ever put in my mouth and I’ve been back for many since my first visit. Have also made a loose arrangement to meet up with my Aunt, who I believe you know, for a lunch visit sometime soon. Great blog, see you soon, or certainly at Xmas I believe? Props for the pics BTW. I can never seem to get enough light for indoor photies cos I have an aged iPhone with no flash. They do make and sell sushi but it’s vegetarian. Very good, but TBH, I like raw meat with my seaweed and vinegared rice. They also make the pieces for one of the smaller sandwich shop chains in Glasgow, can’t remember the name of the chain but they charge a fiver for pieces you can get at C&H for just £3.50. Dunno though… I quite fancy black pudding sushi… maybe I’ll put in a request!! !